I have some very long QuickTime .mov files with the sound produced with Aperture, some won't play on iPhone. One of my friends suggests trying to convert the .mov files to .m4v. Is there any good software that will convert MOV to M4V? Additionally, I need these MOV files to be smaller. There are oodles of MOV to M4V converters, with more being added every year. For example, you can use Handbrake to convert MOV to M4V or use an online tool to convert MOV to M4V free online without the need to install extra software. However, we don't recommend online converter here since most of them have 100MB file size limit. We pick out the best of the best here, with the explanation of how to convert QuickTime MOV to M4V. 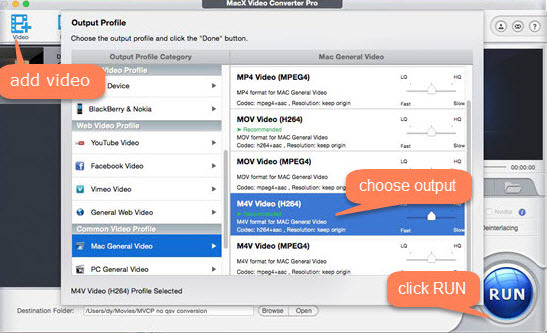 The best MOV to M4V converter introduced here is MacX Video Converter Pro. There are many reasons to use this program instead of Handbrake and online MOV to M4V converters. 1. Hardware acceleration, HT tech and multi-core processing make the best video converter for Mac/Win convert MOV to M4V for iPhone iPad Apple TV etc. with 5X faster speed than Handbrake and online tools. 2. Convert MOV to/from M4V, MP4, AVI, WMV, MKV, FLV, AVCHD etc. with no limits on the file size and the number of videos users can convert. 3. Offer 400+ preset profiles for iPhone X, iPhone 8, Apple TV, iPad, Android mobile devices etc. 4. Compress MOV before conversion with up to 90% compression ratio and no noticeable quality loss. Featuring a well-designed user interface, the QuickTime MOV to M4V converter is very easy to use. Use steps below to get started. The guide can also be used to convert M4V to MOV, MKV to MP4, WMV to MOV, M4V to MP4, M4V to AVI, and more. Step 1: Free download the MOV to M4V converter for macOS (macOS High Sierra also supported) or download its Windows version on your computer, and launch the program. Click Add video on right and select M4V files from your computer to load. Batch conversion is supported. Videos will be loaded quickly. Step 2: An Output Profile window will pop up, from which you can choose an output format. Click Mac General Video, select M4V Video (H.264), and click OK to save the setting. Step 3: Click RUN to start to convert QuickTime MOV to M4V on Mac or Windows. If source MOV files size is big, learn how to compress MOV and convert it to M4V with smaller file size. We've mentioned Handbrake a lot before. As a top free video converter for Mac/Windows, Handbrake gives acceptable MOV to M4V conversion performance though it's a bit slower than the above professional MOV to M4V converter. Its interface may be complicated for beginners, but it's not difficult to learn how to convert QuickTime MOV to M4V with Handbrake if you leave the settings alone. For advanced users, please refer to best Handbrake settings. Step 1: Download Handbrake Mac version or Windows version, and run it on your computer. Click "File" under the Source Selection in the left pane, and select source M4V file from the computer. It may take some time for Handbrake to load the source file. Step 2: Click Browse to select a destination folder to save the converted MOV file. Step 3: Adjust video and audio settings if you like. On the left side, you can select preset before MOV to M4V conversion. Step 4: Click Start Encode to begin to convert QuickTime MOV to M4V. Working as a solid M4V converter for Mac/Windows/Linux, Handbrake can also convert M4V to MP4, convert H.265, MOV to MKV, MKV to MP4 etc. Free download the best video converter for Mac/Windows to quickly convert MOV to M4V, as well as M4V to MP4, M4V to AVI, M4V to MP3, AVI to MP4, AVCHD to iPhone, FLV to iPhone, YouTube to MP4/MP3, etc. with preset profiles for Apple TV, iPhone (X/8), iPad, Android mobile devices.